When you are negotiating, you and the other party are seeking to reach an agreement. Wishful thinking and assumptions can make you believe that you are in agreement. Sometimes one party will even say: Now we are agreed. A moment later it becomes apparent that you have differing ideas about what the agreement covers and what it is about. This disconnect indicates that the oral summaries made during the process have been misunderstood, or there have been too few of them. There must be a written summary. It should be drafted and reviewed before the delegates part company at the end of the session. 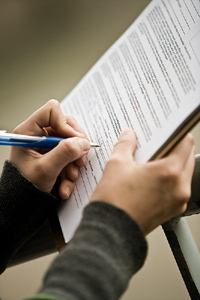 If the parties can agree on the language of the written summary, misunderstandings and future disputes can be avoided. You will be surprised to discover the degree to which the other side has not heard you correctly and how unclearly your alternative solution has been communicated. But if you ask for the written summary you will get an opportunity to correct the misunderstandings so the delegation is contemplating the alternative you actually intend and the terms you have in fact suggested. It is not as effective for you to write down your understanding of the agreement and send it to the other party a week later. This approach can lead to further disagreement and misunderstandings and the other delegation feeling manipulated or hoodwinked. A written document can be interpreted, or misinterpreted, many different ways. If possible ask your opponent to write the summary. When you analyze the other party’s summary and scrutinize their choice of language and the attitudes expressed, it will sometimes give you an inkling of whether they will accept the proposed solution. When this does not work, summarize the message of the other party: what you’re telling me is that you can’t make a decision today. In this way you avoid misunderstandings and force the other party to send clear signals. This also allows the other party an opportunity to explain himself. You can be provoking in your summary in order to test boundaries by summarizing “incorrectly”. You add things, you subtract things, and you modify in such a way that you are testing the waters for the next stage of the negotiation. It is often effective to forward appropriate documentation to the other delegation prior to the negotiation that will support your arguments and positions. The other party will be more receptive to your message, better prepared, and equipped to ask meaningful questions. You will waste time and lose trust if you take the other party by surprise at the negotiating table. They will not be able to answer your questions. They cannot benefit from the information when it is given to them all at once causing them to feel overwhelmed, insecure, and unable to act. You should forward additional documentation to your counterpart after the session. Provide a full set of documents, highlighting the most important points in an accompanying letter. Document everything you have agreed to in writing. If disagreement occurs later on, your documentation will become highly valuable. Always review the negotiation afterwards, interpret your notes, discuss things you’re your colleagues, analyze the result, and establish new objectives. Assess your own performance and that of your colleagues and adjust your strategies and tactics so that you are advancing your objective and moving toward a win-win solution.